Up front and honest, Tickets There have never been very knowledgeable fans of guitar god, Mr. ‘Slowhand’ himself – Eric Clapton. Aside from a handful of standout classics from his long and very illustrious career, we are unfamiliar with the legend on an album to album basis. Not that this interfered with tonight’s show at the O2 Arena however as we were treated to two hours of ‘incendiary’ (all young writers like to stick that word in ever since we all saw Almost Famous – finally justified to use in this instanceJ) guitar playing, amazing musicianship from two of the best key belters you’ll ever find; not to mention the presentation of the entire night. Great showmen will always leave you feeling happy, but inspiring musicians will leave you feeling gobsmacked. Eric is of course the epitome of the latter experience. Arriving early is a necessity tonight as Mr. Clapton has brought the excellent Andy Fairweather Low and his band, The Low Riders along for the tour. Apparently everyone else feels the same as the Low Riders are greeted by a full house for their guest spot. Andy is best remembered for his time with the British pop rockets, Amen Corner but he’s matured with the years to become a shinning example of excellent live musicianship fuelled by an experienced, seasoned love from blues rock. Andy’s onstage banter and accompanying selection of early rock classics, blues numbers and his own material make for a perfect warm up show. It may have been several decades since Andy last played the capital, but tonight’s reception will surely entice him to visit again soon. With a short interval for set-up, Eric Clapton and band arrive on stage very unceremoniously to a roaring house. 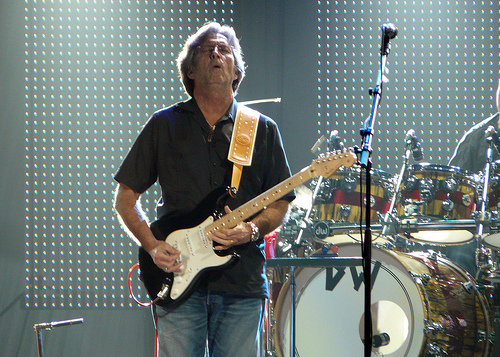 Clapton’s live shows have never focused their performances on gimmicks, theatrics or OOT novelties. Rather they centre on the incredible skill of the performers and tonight is no exception. Backing musicians Willie Weeks (Bass), Steve Gadd (drums) and accompanying singers all provide an excellent rhythm section, while keyboardists Chris Stainton and in particular Tim Carmon, push things over the edge and nearly steal the show with their awe-inspiring talent and control of their instruments. Of course, no-one in the world is going to upstage tonight’s star! 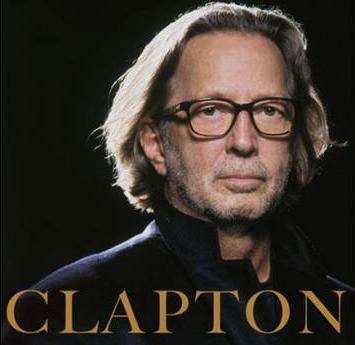 Clapton wastes no time displaying his almost effortless control of the guitar with note perfect performances of Key To The Highway, Going Down Slow and Hoochie Coochie Man. His cover of Bob Marley’s classic ‘I Shot The Sheriff’, thrills greatest hits fans while Nobody Knows You When You’re Down And Out brings a little happy swagger back into the night. A man of few words, Eric takes the chair for a number of acoustic tracks including Gary Moore’s Still Got The Blues, When Somebody Thinks You’re Wonderful and a reworked blues version of Layla. Aside from the regular thank-yous, Eric doesn’t communicate much with the crowd but does take the sitting down opportunity to joke he always “dreamed of becoming a DJ”. It may not have landed the laughs that Andy Fairweather Low had managed but it’s enough to show the legend is enjoying himself tonight. Strapping the electric on, Eric returns to full form for an explosive version of Cream’s classic Badge before blowing the crowd away with a powerful performance of Wonderful Tonight. Of course, no Clapton show would be complete without his classic version of John Cale’s Cocaine which ends the main set and brings the arena to its feet. Just in case the crowd hasn’t yet understood that we’re in the presence of one of the greatest guitarist of all time, the band arrive back for one final blue performance of Crossroads. With that, Eric waves and the band are gone in the same unceremonious fashion they arrived. But they’ve done their job tonight. Crowd happy, TT happy. Now when’s he coming back? 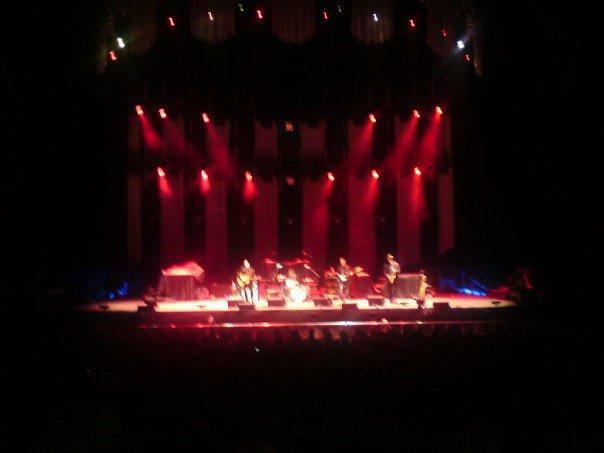 This entry was posted on May 10, 2011 at 12:46 pm and is filed under Gig Review, Music with tags Amen Corner, Andy Fairweather Low, Chris Stainton, Cocaine, Eric Clapton, Layla, live review, Nobody Knows You When You're Down And Out, O2 Arena, Slowhand, The Low Riders, Tim Carmon. You can follow any responses to this entry through the RSS 2.0 feed. You can leave a response, or trackback from your own site.